The 2017 Annual APIPA Conference will take place from August 21-25, 2017, in beautiful Majuro, RMI. Join hundreds of participants from throughout the Pacific: August 21-25, 2017, Majuro, RMI. Join the regional public auditors for the 2017 Annual APIPA Conference, scheduled for August 21-25, 2017 in Majuro, RMI. APIPA features world-class instructors with experience as practitioners in their fields. Join us August 21-25, 2017 in Majuro, RMI. Iakwe and Welcome to the 2017 Association of the Pacific Islands Public Auditors' conference website. 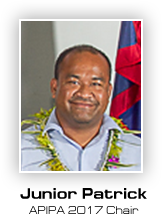 The Office of the Auditor-General (OAG) of the Republic of the Marshall Islands (RMI) is pleased to be the host of the 28th Annual APIPA Conference which will be held during the week of August 21 to 25, 2017 in Majuro, the Capitol of the RMI. The theme for this year's APIPA Conference is "Charting a Journey Towards Greater Government Accountability," which reflects the mission of APIPA. One of the founding principles of APIPA is to establish an organized body to act as one voice in support of the goal of promoting efficiency and accountability in the use of public resources of member jurisdictions. As in previous APIPA conferences, this year's conference will feature a variety of auditing and finance courses throughout the week for our participants from across our islands. With support from the Graduate School USA and the U.S. Department of the Interior's Office of Insular Affairs, we have recruited first-class instructors to deliver basic to advanced level courses in both the Audit and Finance tracks. With such high-quality instructors and a wide range of audit and finance courses planned, I am positive that each participant will find great value in their time in Majuro, and will return home to contribute more to their respective organizations. We have also planned several after-hours activities throughout the conference week which can be found on the registration sheet. Participants who plan to attend any of these activities are encouraged to sign-up during registration. Aside from these activities, Majuro also offers a variety of places to visit and things to do. APIPA will host an evening reception on Monday, August 21st, 2017 at the Pool Side of the Marshall Islands Resort, and we invite all participants to join us. Finally, I would like to convey our most sincere appreciation to the Unites States Department of the Interior's Office of Insular Affairs and the Graduate School's Pacific Islands Training Initiative for their continued support of APIPA. I invite you to explore the resources on this website and encourage you to join us in Majuro for the 28th Annual APIPA Conference.